Freeway segments: Information about the various freeways is divided by freeway segment. Segments are based on logical divisions of the routes, or at least what I consider to be the logical divisions. Routes with more than one segment are given directional identifiers. For example, I-35 North is the segment of I-35 north of downtown. Interstate 37, Interstate 410, Loop 1604, Spur 371, SH 151, and the Wurzbach and Kelly Parkways are all single-segmented. US 90 and US 281 are technically bi-segmented, but one of their two segments runs concurrent with an Interstate, so only the non-concurrent segments are listed as the US route. For example, US 281 South runs concurrent with I-37, so you will not find a page for US 281 South; see I-37 instead. Travel directions: On my site, I give directions such as "northbound", "southbound", "eastbound", or "westbound"-- these indicate the specific traffic lanes along a given freeway route. For I-10 West, since it is signed east/west but actually runs more north-south, I generally use "inbound" (i.e. toward downtown) or "outbound" instead to avoid confusion. Putting it together: So, what does "southbound I-35 North" mean? The southbound lanes of Interstate 35 north of downtown. Route termini: On each of the pages, I discuss segments of freeway within what I consider the urbanized area of San Antonio. Generally speaking, this includes the stretches of freeway that have nighttime illumination and/or one-way access roads, two hallmark urban freeway characteristics in Texas. The length listed for each segment is the length that I detail on that page. The official San Antonio Urbanized Area varies somewhat from my definition. Over time, as the city grows, I have and will extend those termini as appropriate. Below are some basic statistics about San Antonio's freeways. All statistics are from the Federal Highway Administration (2010 data) and cover the San Antonio Urbanized Area. The number in parenthesis is the San Antonio's rank nationally for that category. The city's freeway network was designed on the spoke-and-loop system. Eight radials, two loops, a spur, and a crosstown parkway make up the system. The goal of the system's planners was that no Bexar County resident would be more than 30 minutes from downtown San Antonio. With today's traffic and overall growth of the city, the new rule is more like 30-45 minutes, but the spirit of that goal-- a comprehensive controlled-access highway network-- has been realized. 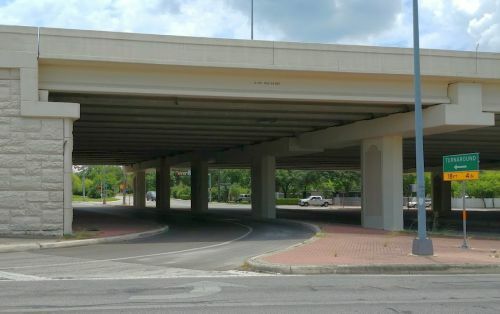 San Antonio is a classic example of a city that would come to a grinding stop without its freeways. Many destinations require a freeway trip, including many short-distance journeys. Only a swath of the northwestern part of the city lacks relatively close freeway access. In the past, most of the city's busy freeway segments outside downtown were six lanes, but over the past couple of decades, many of them have been expanded to eight and 10 lanes. In 2005, about nine miles of freeway were 10 lanes; today there are roughly 30 miles. Lane count map. Lane counts do not include auxiliary lanes or transitional changes in lane counts. Texas uses frontage roads extensively, and San Antonio is no exception. Locally, they're traditionally referred to as "access roads." Only about ¼ of the freeways here don't have access roads. These include I-10 East, I-37 South, US 281 North between downtown and Loop 410, and about half of US 90 West. The downtown freeways also lack access roads. In these areas, ramp systems seen in the rest of the world are used. Dedicated U-turn lanes are usually provided at intersections to allow traffic to turn-around and head the opposite direction on the opposite frontage road without having to traverse the signalized intersection. In San Antonio, these are known as "turnarounds" and are so marked. For more information on frontage roads and turnarounds, see my Texas Highways primer. Median barriers in Texas have shifted away from conventional Jersey Barrier to Constant Slope Barriers. All new projects in the San Antonio area since the early '90s have featured that type of barrier. Fencing atop the median barriers used to be universal on area freeways. In the late '80s, however, median barrier fencing was phased out. New freeway construction did not include it, and damaged sections were not replaced. Fifteen miles of fencing was removed in 1996 on Loop 410 to accommodate conduit for TransGuide fiber optic cable atop the center barrier. The fencing has since been removed from all of the other freeways. Like median barrier fencing, ramp meter signals are now a thing of the past in San Antonio. 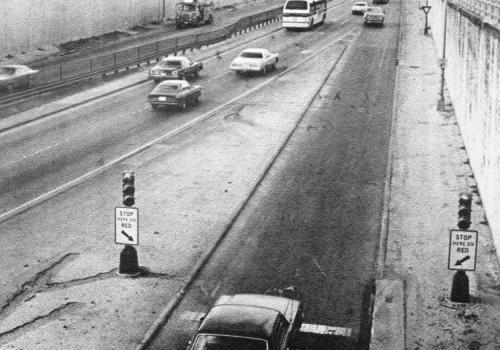 The first ramp control signal was installed in May 1973 on the entrance ramp from Culebra to eastbound I-10. By 1980, there were nine locations equipped with meter signals. All but one of these were in the downtown area along I-10 or I-35. The exception was the southbound US 281 entrance ramp from eastbound Basse. San Antonio even boasted a rarity in ramp metering: a meter signal on a freeway-to-freeway ramp, specifically the southbound US 281 ramp to southbound I-35. In addition to the meter signals, there were also two entrance ramp gates-- one on the entrance ramp from Colorado to eastbound I-10 (this ramp no longer exists) and one on the entrance from St. Mary's to southbound I-35. These gates were used to close the entrance ramps during the morning rush hour to help reduce congestion caused by traffic influx and weaving problems associated with the proximities of those entrances to other ramps. I-10 and I-35. For a long while, the ramp meter on the Basse entrance ramp to US 281 was the last one remaining in the city, although it was rarely used. It was upgraded in early 2005 with new equipment, but subsequently removed entirely in June 2005. Roughly eight miles of I-10 and I-35 around downtown San Antonio are double-decked. These freeways were rebuilt as part of the $272 million "Downtown Y" project from 1983 to 1994. Named for the "Y" formed by I-10 and I-35 west of downtown, the project improved 10 miles of the seminal four-lane freeway system built in the late '40s and early '50s. Besides being obsolete, those freeways had suffered from chronic congestion almost since they had opened. Earlier proposals to relieve the congestion there by constructing a bypass route on the near West Side were eventually scuttled. About six miles of the original freeway was located below grade and in a narrow right-of-way that made a conventional widening prohibitively expensive. The double-decking added elevated structures on a single row of piers located just to the outside of the lower level but within the existing right-of-way. This allowed the upper level to overhang the lower level, thus allowing the additional lanes to be shoehorned into the original right-of-way. The elevated structures were built using a then-new type of construction called "segmental winged-T" bridges. Besides being aesthetically-pleasing, this method had the major technical benefit of allowing the bridge segments to be cast off-site and then trucked in and assembled in-place, thus expediting construction and minimizing traffic disruption. A group of segments was lifted onto a special support truss, joined together with epoxy, and then tensioned cables called tendons located within ducts inside the segments were tightened to hold the structure together. An engineer likened it to a suspension bridge but with the cables inside the bridge. An observant motorist driving on the lower levels may notice a difference in the piers used on each side of the road. The original design was modified midway through the project and made improvements to the bridge segments that made the casting process easier and reduced costs. This new design increased the width of the bridge "spines" and, thus, required a wider pier to support it. In 1995, a section of the upper level of I-10 near Fredericksburg Rd. was closed when cracks were discovered in a couple of support piers and segments. A temporary support, similar to the ones used to support damaged bridges after an earthquake (which, coincidentally, occurred in the area a few days later) was installed and the upper level, except for the Fredericksburg Rd. entrance ramp, was reopened. That entrance ramp, as well as the main upper level section, were eventually reinforced with strategic steel rods. Other than this, the design has fared well, and the double-decked roads have added much needed capacity to the downtown area freeway network. For photos of the double-decked freeways, click here. For a diagram on how the upper levels were built, click on the picture below. Until the repeal of the 55/65 national speed limit, all freeways in the San Antonio area were 55 mph or less, and I-35 was 55 mph all the way to FM 306 north of New Braunfels. Most freeways inside of Loop 410 are now posted at 60 or 65 mph. Outside of 410, speed limits are generally 65 on the Northside and 70 on the Southside. Speed limits jump up to 70 outside of Loop 1604 on the Northside. Loop 410 is 65 mph north of US 90 and 70 mph to the south. Loop 1604 is generally 70 mph on its freeway segments with some 65 and 55 stretches in Live Oak and Universal City and 60 mph on the newest segment south of Bandera Road. While the City of San Antonio still has an ordinance declaring that the minimum speed limit on freeways is 10 mph below the posted maximum speed limit, minimum speed limit signs were removed during the mid and late '90s. In 2004, the San Antonio City Council passed an ordinance prohibiting trucks from using the left lane of US 90 (both East and West) inside Loop 410 between 6am and 9pm Monday through Friday. This was a trial project to determine whether similar restrictions should be implemented on other area freeways. A before-and-after study showed an overall 10% reduction in crashes along the corridor with a 30% reduction in crashes involving trucks. However, the restriction has not been expanded to any other freeways within the city of San Antonio. In February 2007, the Texas Transportation Commission extended the existing left lane truck restriction in place along I-35 in the Austin area south from San Marcos to just inside Loop 1604. A continuation of that restriction on I-35 through the city of San Antonio was subsequently investigated but no action ever taken. Signage on local freeways is generally good. However, Interchange Sequence Series signs (the signs that show the next three exits), which are used widely in many urban areas, are only used sporadically here. Schematic signs before major interchanges, also widely used in other cities, are conspicuously absent here, although they are being added to new interchanges more often. Another peculiarity are control cities. On radial routes, many, but not all, pull-through signs switch the inbound control city from "San Antonio" to "Downtown San Antonio" at about Loop 410. But US 90 West and I-37 South just use "San Antonio" and I-10 West has several signs inside and outside of Loop 410 reading "San Antonio/Houston" even though signs approaching Loop 410 read "Downtown San Antonio". Meanwhile, even when the radial control city is "Downtown San Antonio", guide signs on the corresponding Loop 410 ramps just show "San Antonio". The only major freeway that was a persistent component of freeway plans over the years but never was built was the Bandera Expressway. This road would have filled what is now an obvious missing link in the network. Two corridors were proposed over the years for this freeway. The first, proposed in 1964, would have started at Bandera outside Loop 410 and paralleled Bandera to Guadalupe St. before turning east, crossing I-35 and following Cesar Chavez to I-37, then heading northeast to end at Commerce east of downtown. (One version of this route is shown here.) The second route, proposed around 1971, would have run along Culebra from I-10 West to Loop 410. (Click here for a map.) Opposition due to the projected displacement of thousands of residents of the West Side eventually killed the project. A downtown bypass route for I-10 was proposed several times in the '50s and '60s to relieve congestion along the original expressways downtown. The first proposal would have routed it down Navidad Street. Subsequent plans had it further east, first along or near Brazos Street, then following the railroad right-of-way. This bypass was scrapped in the mid '70s in favor of double-decking I-10 instead. Two small connector freeways branching from US 281, were also proposed in 1964. One would have connected 281 with I-35 roughly along St. Mary's St. The other would have upgraded San Pedro north of Loop 410 to 281 to a freeway. Finally, a freeway along Roosevelt Ave., which at the time was US 281, was briefly proposed in the mid '50s. For more information on the history of the freeway system and proposed routes, see the history page. Looking at maps and seeing the way it was built, State Highway 16 South and Spur 422, which branches off of I-35 in southwest San Antonio, was likely intended to eventually be a freeway. In fact, the road is officially named the Poteet-Jourdanton Freeway. Strictly technically-speaking, though, it should named Poteet-Jourdanton Expresswayas the road is a four lane divided highway with signalized intersections but has frontage roads along several miles. This configuration would have allowed the roadway to be upgraded to a freeway relatively easily by simply building overpasses for the mainlanes at the major intersections. Additionally, the interchange at I-35 used to have direct ramps from I-35 to SP 422 (those ramps were subsequently removed ca. 2010.) When the road was built, most projections saw the city expanding to the south. Instead, San Antonio has grown northward and westward. As a result, the relatively lightly-used Spur 422 remains mostly in its original configuration. The Alamo Area Metropolitan Planning Organization (AAMPO) is an agency created in accordance with federal law to coordinate and distribute state and federal transportation funding for the San Antonio Urbanized Area. This area originally included Bexar County and parts of neighboring Comal and Guadalupe County. In 2014, it was expanded to include all of Comal and Guadalupe counties as well as southern Kendall County around Boerne. AAMPO was previously named the San Antonio-Bexar County MPO and prior to that the San Antonio-Bexar County Urban Transportation Study (SABCUTS). SABCUTS was established in 1963. The Highway Department started the Freeway Courtesy Patrol in 1968 during HemisFair to assist the high volume of tourists coming to the city for the fair. It was disbanded after the fair, but returned in 1979. The patrol would assist stranded motorists, clear debris from the roadways, and assist at accident scenes. Courtesy Patrol workers provided gasoline, water, battery jump starts and tire changes, but they did not make mechanical repairs. The patrol trucks were also equipped with fire extinguishers and traffic control equipment. The Courtesy Patrol was discontinued in the mid 2000s due to budget issues. However, in 2018, TxDOT requested funding to restart the program. Because of the extensive network of freeways, studies show that San Antonio suffers lower levels of overall congestion compared to other large cities, although it has increased substantially in recent years. On average, the freeway and arterial street systems are operating slightly over capacity. However, most North Side freeways do suffer chronic delays; Loop 410, Loop 1604, US 281, SH 151, I-10, and I-35 all have areas of moderate to severe daily congestion. Expansion work is underway or planned for many of these roads. Also, the TransGuide system was implemented to manage and ease this congestion. Rush hours are generally from 6-9 am, and 3-7 pm. Vehicles with hazardous cargo are completely banned from the red sections and banned with the exception of specific local deliveries on the orange sections. All through hazmat traffic must use the green routes. The San Antonio area gets winter precipitation only about once or twice a year on average, usually in the form of freezing rain or sleet. Such precipitation, of course, makes driving very hazardous. As a result, TxDOT and the San Antonio Police Department have formulated a plan to manage the city's freeway system during such events. The plan calls for TxDOT to begin de-icing bridges and overpasses using chemical agents and crushed limestone (chat rock) when such precipitation begins or is predicted. If conditions become too dangerous, the plan calls for most of the freeway system to be closed, mostly in areas with many overpasses or elevated lanes. To prepare for this eventuality, TxDOT has barricades pre-positioned at exit and entrance ramps to enable them to be quickly put into position by highway workers and police and has hinged signs on the freeways to announce the road closures and direct traffic off the freeway. Traffic is then routed to the access roads until conditions improve.